Patchwork quilt made from squares of cotton fabrics, from curtains, left over from dress making projects, and new fabrics. Colours are bright primaries and some pastels, prints are checks, florals, stripes and plain. Pieces were stitched together without any particular order. No padding or quilting. Backing is a cotton bedspread in turquoise and blue stripes. Made by Barbara McCabe while living in Geelong (VIC), 1969, early 1970s. Owned by Barbara McCabe. Barbara and her husband David were school teachers, and moved around Victoria, from Echuca to Research to Geelong/Highton. Barbara made a number of quilts in this style during the 1960s and early 1970s as bedcoverings for the family. 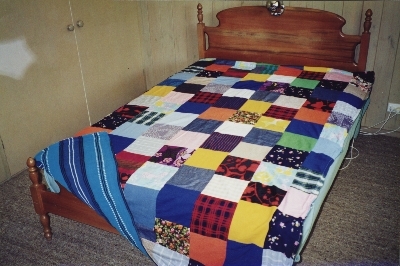 When they ended their life as bed coverings, they were/are used as car boot liners, packing around furniture, etc.This quilt was made for her daughter, Mandy, and was still being used in 1985. Handsewn cotton hexagons in a wide variety of patterns. Centre oval of hexagons with 2 outer rings. There is no padding and the backing is white cotton. Grandmother's Flower Garden, also known as French Bouquet. The quilt comprises 181 flowers. No padding is used. Each flower has seven hexagonal patches, cut from a metal template pattern. Floral and plain silk materials are used and mounted on pale blue moire taffeta. Patchwork quilt for a child made from suiting pieces from the Castlemaine Woollen Mills in Victoria. One side has dark rectangles in greys and navy, the other side uses pieces in light browns, cream and rust, with dark grey. The edging is also made from suiting. No padding Machine sewn. Medallion style all cotton quilt made in the USA. Hand pieced with centre panel of 'cheater' material pre printed in a patchwork design. Bordered with 'Nine Patch' and sashing. The backing is printed cotton and the padding is cotton. The quilt has yellow tufting or ties in wool. Quilt No.675OHM - Oakey Historical Museum Society Inc.
Cotton patchwork cover constructed from hand sewn hexagons (65mm) in cotton and linen furnishing materials. The curved edges are bound with blue and cream printed striped cotton. The backing material is not visible.